Quick summary: Students design their own model of a biosphere that is self-sustaining and demonstrates the interactions that occur naturally. Students will keep a scientific journal about their research project to record their planning, their background research, how their ideas develop, strategies and possible solutions to identified problems, resources accessed, and findings and evaluations from their investigation. 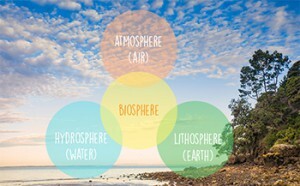 Students understand the core elements of the biosphere, including some of its components and its function. Students recognise that human behaviour can negatively affect the health of the biosphere, and what actions they can take to conserve various elements of the biosphere. Syllabus outcomes: SC5-12ES, SC5-4WS, SC5-5WS, SC5-6WS, SC5-7WS. Cross-curriculum priority: Sustainability OI.1., OI.2. Relevant parts of Year 10 Science achievement standards: Students describe and analyse interactions and cycles within and between Earth’s spheres. 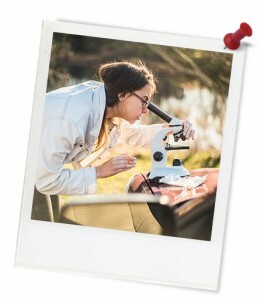 They develop questions and hypotheses and independently design and improve appropriate methods of investigation, including field work and laboratory experimentation. When analysing data, selecting evidence and developing and justifying conclusions, students identify alternative explanations for findings and explain any sources of uncertainty. 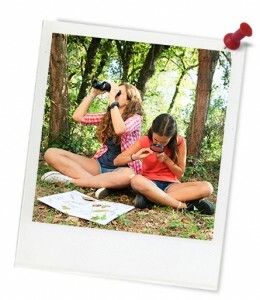 Topic: Outdoor learning, Climate Change, Biodiversity. Level of teacher scaffolding: Medium – facilitate discussion, lead students in activity, remind students of outdoor learning rules. Resources required: Student Worksheet – one copy per student OR computers/tablets to access the online worksheet. Printed copies of the Rake Worksheet – Biosphere (one for each pair of students). Each student will need to bring from home a large glass jar or fish tank, pond water, aquatic plants, macro-invertebrates, soil, moss, algae, terrestrial invertebrates, a small fish (optional), and a seashell. Students will also need: pH testing kit, thermometers, cling film (for covering top of biosphere), sticky tape, pens and pencils. Suggested questions and device for creating video journal. Biosphere Experiment Assessment Rubric. Keywords: Ecosystem, biotic, abiotic, biosphere, lithosphere, atmosphere, hydrosphere, water cycle, closed system, interactions, habitat, ecological niche, outdoor learning. Safety: Ask students to review your Class Safety Code for working with live animals. Overarching learning goal: Students discover that the biosphere is made up of the atmosphere (gases), hydrosphere (water) and lithosphere (land), all of which interact. They explore what happens to an ecosystem when the balance is upset by human activity, and use data collection techniques to monitor the biosphere. Finally, by engaging in scientific inquiry, students develop their knowledge of ideas and concepts and gain understanding of the importance of evidence in formulating and evaluating explanations in the development of scientific ideas. Finally, students will be able to recognise some of the mental, physical and academic benefits of completing classroom activities outside. Thought starter: What would you take in your spaceship? Have a look at these two images and discuss (in pairs or as a class) the ways that human systems are similar to the Earth's systems. Nothing goes in. Nothing goes out. Every output must be an input. Every input must come from an output. You are to work in small groups to create a spaceship biosphere that models the interactions and cycles on Earth. You will discover why interactions between biotic and abiotic components of an ecosystem need to be in balance. You will monitor the health of your biosphere by recording data and writing a scientific report.